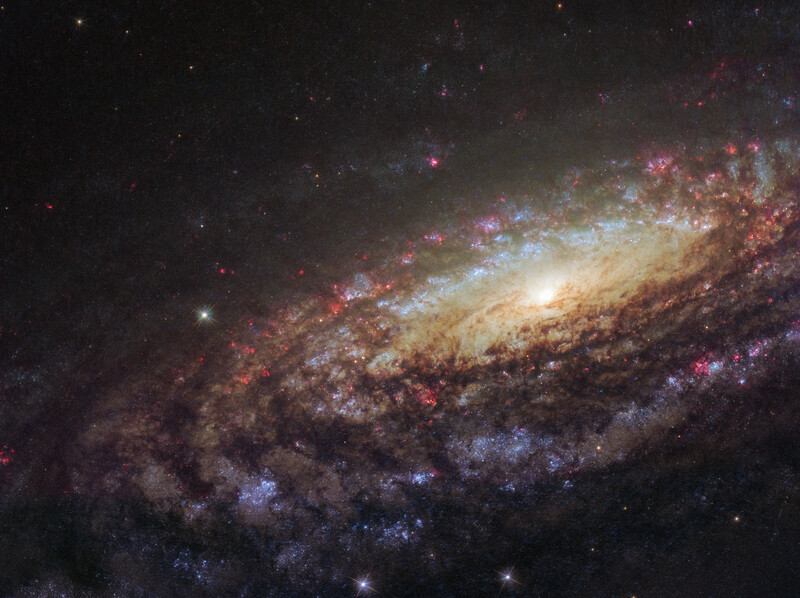 Explanation: Big, beautiful spiral galaxy NGC 7331 is often touted as an analog to our own Milky Way. About 50 million light-years distant in the northern constellation Pegasus, NGC 7331 was recognized early on as a spiral nebula and is actually one of the brighter galaxies not included in Charles Messier's famous 18th century catalog. Since the galaxy's disk is inclined to our line-of-sight, long telescopic exposures often result in an image that evokes a strong sense of depth. In this Hubble Space Telescope close-up, the galaxy's magnificent spiral arms feature dark obscuring dust lanes, bright bluish clusters of massive young stars, and the telltale reddish glow of active star forming regions. The bright yellowish central regions harbor populations of older, cooler stars. Like the Milky Way, a supermassive black hole lies at the core of spiral galaxy NGC 7331.